Father José Miguel Marqués Campo is a priest in the Archdiocese of Oviedo, Spain, at the Basilica of the Sacred Heart of Jesus in the city of Gijón. Father was also appointed the official chaplain of the Traditional Latin Mass for Oviedo by the archbishop. Search as you might, you will find no greater supporter of authentic Catholicism and beautiful liturgy than Fr. Jose Miguel. We have visiting priests and family at the Basilica of the Sacred Heart in Gijón, my pastoral destination (though God only knows for how long). And well, today at “luncheon” (which is the main meal in Spain), some were discussing the “traditional” doings of an 87-year old parish priest in another diocese in Spain. Though they were to be sure respectful, nonetheless they were criticizing him for doing things in a “1950s” style. You know, times change, etc., etc., etc. And what does he do, you may ask? Well, for starters, he refuses to give Communion in the hand, or very reluctantly, and for the children of First Communion in his parish, he insures they learn how to receive on the tongue, with no exceptions. He is also criticized for abolishing the “rite of peace” at Mass, since in his opinion, it had gone too far and was very un-liturgical. The criticism is that he is now too old, he should be made to retire in order to be taken care of. I listened very patiently and surprised all (those who know me, not really), by coming out in favor of this 87-year old priest whom I do not know personally, but with whom I agree. I mentioned that the rite of peace at Mass is not an obligatory rite (like the lavatory of the hands before consecration is an obligatory rite that hardly anybody does) and I have practically eliminated the “sign of peace” altogether whenever I celebrate Mass. I also mentioned that Communion in the hand, while “permitted”, is not the universal norm of the Church; and in any case, detracts from Eucharistic piety. The visitors were surprised that I, too, went along with the older priest’s pastoral line-of-thought, that they were criticizing. Yes, I said, I am very traditional and do not simulate this in any way, because I am simply and openly Catholic. That I no longer just shut up like I used to, because enough is enough. Oh yes, I am hated for it, or at least, am very uncomfortable for those who do not think along these traditional lines. But when they mentioned that be that as it may, this 87-year old priest should not “impose” his traditional “1950s” pastoral views on his parishioners, like forcing his First Communicants and other faithful to receive Communion on the tongue, and even bidding them to kneel (that’s what Benedict XVI had done, but God forbid! ), that made something inside me snap. “Oh, he should not “impose”, oh, yeah, you mean that he shouldn’t do what others do, like “imposing” in some places, the absolute prohibition to faithful in our diocese from receiving Communion while kneeling…like when others impose on First Communion children to receive in the hand, etc. My point was that the argument against “clerical traditional imposition” works both ways, because the only things “progressive clerics” do very well is to impose on everybody else their thing. That’s clericalism at its best, even when they do not wear clerical attire. My criticism of progressive clerical imposition set everything on fire. The rector here became upset, telling me that things were not the way I say. And I was starting to burn. Yes it is! That’s exactly what goes on! That’s exactly what’s been going on these past several decades! I absolutely know of people who have been denied Communion when kneeling. They have told me so! What about all this business about being the “hour of the laity” in the Church after Vatican II and so on? What about the rights of these “traditional” laity…or do they not have rights, only the non-traditional laity and priests? It was mentioned that catechists instruct children in both ways to receive Communion… Really? Who does that? Nobody does that, come on. With very rare exceptions, whenever I give Communion to children at the Basilica (we’re not a parish but a Sanctuary, without Baptisms, Confirmations, and First Communions), the practical totality of them receive on the hand. This saddens me to no end. Why? Because they were taught by imposition to do so in their parishes. The children do not know any other way of receiving communion. I only know that children are not taught to receive Communion on the tongue, far less to kneel, only to receive in the hand while standing. That sure looks like “clerical imposition”, doesn’t it? But it’s only “clerical imposition” when traditional priests do “traditional” things. Yeah, right. Then he told me, ever more upset, that I should lower my voice. It wasn’t so loud. But what about his? And then finally, I snapped altogether, and left the dining room with visible distress. Righteous anger? I don’t know. I should like to hope so. I just cannot stand this double-standard anymore. 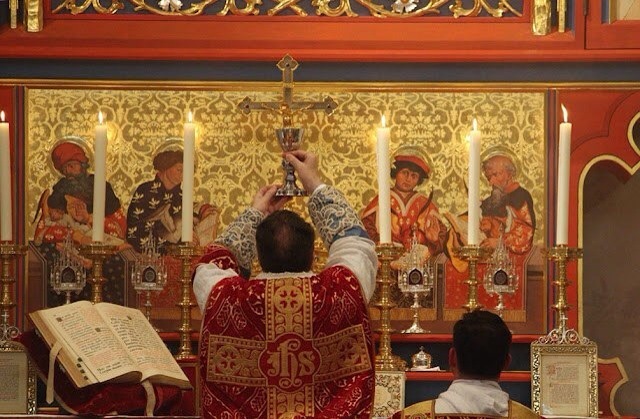 And thank God I didn’t mention how the little Traditional Latin Mass community of my home diocese has been treated: like a contagious plague to be kept at bay in a ghetto. And this includes not only the local faithful, but also visiting summer faithful from Madrid, León, Santander, Britain, France, Switzerland, etc. Young, reverent families, with reverent children and reverent young people. And they confess as well! I am always moved while giving them Communion: a world of difference! But they’re a plague too, I guess. Please, God, I have never and will never do that. You’re either Catholic or you’re not. And that’s it. Posted on August 14, 2014, in holiness, liturgy and tagged archdiocese of oviedo, communion in the hand, Fr. José Miguel Marqués Campo, spain latin mass, traditional catholic priest. Bookmark the permalink. 9 Comments. wooow! kudos to Father Jose Miguel! what a tremendous example for the rest of us laity, religious or priests. I disagree with Father on one point: it is never useless to try to reconcile the Church internally. We must strive for the truly Catholic unity of all. I am so eternally grateful for the grace that lead me out of the Novus Ordo. God bless Father Miguel. We need more good priests like him. The novus ordo lends itself to everything that takes place within it. It is a waste of time to try to salvage it. It is truly lipstick and makeup. You can wear Roman vestments etc in an Episcopal or Methodist service but it doesn’t make it Catholic. The novus ordo is a cheap banal concoction and what happens during the performance is what was always intended. In fact when Latin and traditional elements are introduced they don’t seem natural or fitting.